The Faculty participates in the JESSUP International Moot Court Competition. This is a worldwide moot court event sponsored by the International Law Students Association (ILSA) .Every year KNUST Faculty of law competes with the University of Ghana and the Ghana School of Law in the regional round and the winner represents Ghana in the international round that takes place in the United States. The Jessup competition uses a problem selected by ILSA, generally based on controversial issues in public international law. This moot court follows the procedure of the International Court of Justice in the Hague. 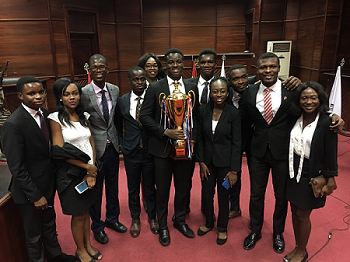 The KNUST Moot Court Team made history on Thursday 8 February 2018 when it beat the University of Cape Coast Moot Court Team to become the first Law Faculty in the country to successfully defend its championship title at Ghana Qualifying Rounds of the Philip C. Jessup International Law Moot Court Competition. 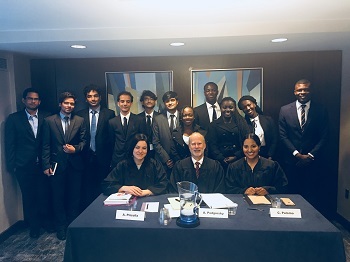 In 2017, the Team won the Ghana Qualifying Rounds and represented Ghana at the White & Case International Rounds of the Competition in Washington D.C., where it emerged as the second highest ranking Team from Africa. A moot court is a simulated court proceeding in which law students, acting as lawyers, argue a hypothetical case before a panel of judges who may in fact be real judges or just lawyers. The Philip C. Jessup Moot Court is the largest and most prestigious International Law moot court competition in the world. It is organized by the International Law Students Association (ILSA) and draws participation from law students all around the world. Teams from over 600 registered Law Schools compete against each other by arguing vexed questions of International Law arising from the relationship of states in a simulated session of the International Court of Justice. The theme for this year’s Competition focuses on the validity of inter-state arbitrations; the legality of the use of autonomous underwater vehicles (AUVs) to gather data from the territorial seas of foreign states; and the obligation of states to comply with their nuclear disarmament obligations under International Law. The Ghana Qualifying Rounds which took place at GIMPA in Accra saw Teams from the KNUST Faculty of Law, GIMPA Faculty of Law, University of Cape Coast Faculty of Law, Central University Faculty of Law, University of Professional Studies Faculty of Law and Kings University College Faculty of Law compete against each other from Tuesday 6 February to Thursday 8 February, 2018. The KNUST Team comprising Mr. Benedict Nii Kraku, Mr. Noah Adamtey, Mr Vitalis Suglo, Mr Oliver Fobi and Ms. Akua Serwaa Agyapong won four out of their five contests including the finals in which they beat the UCC Team to emerge as the national champions. With this feat, the KNUST Team has qualified as Ghana’s sole representative to participate in the White & Case International Rounds of the Jessup Moot Court Competition scheduled to take place in Washington DC from 1 to 7 April 2018. This year’s final round contest was judged by a three-member panel chaired by Her Ladyship Justice Gertrude Torkonoo, a Justice of the Court of Court of Appeal. Other members of the panel were Mrs Marietta Brew Appiah Oppong, former Attorney General and Minister of Justice and and Dr Kamal-Deen Ali, Legal Director of the Ghana Navy and Executive Director of the Centre for Maritime Law and Security in Africa. The KNUST Moot Team was coached by Dr Ernest Owusu-Dapaa, Mr Christopher Nyinevi and Dr Samuel Boadi Adarkwah. The Faculty of Law, Kwame Nkrumah University of Science and Technology (KNUST) won the Runner-Up at the 19th All African Human Rights Moot Competition in Benin.The Faculty has been adjudged the second Law Faculty alongside the Faculties of the University of Lagos, Nigeria and the University of Abomey –Calavi, Benin in the 19th All African Human Rights Moot Court Competition held in CAOTONOU, Benin from 4th to 9th October, 2010.The KNUST team lost to the overall best to the joint team made up of Rhodes University, South Africa, Universite de Cocody, Co’te d, ‘Ivoire and the University of Namibia. It was the third appearance of KNUST Law Faculty since the competition began 19 years ago. Miss Grace Sackey, a third Year student and Miss Rebecca Amponsah, a fourth year student constituted the team for KNUST Faculty of Law. The Team was jointly coached by Mr Ernest Owusu-Dapaa and Mr Oswald Kafui Seneadza, both lecturers in Public International Law. The Faculty of Law participated and won the A.N.E.Amissah Debate Competition Cup this year in Accra. The Competition was established on 17th March 2010.